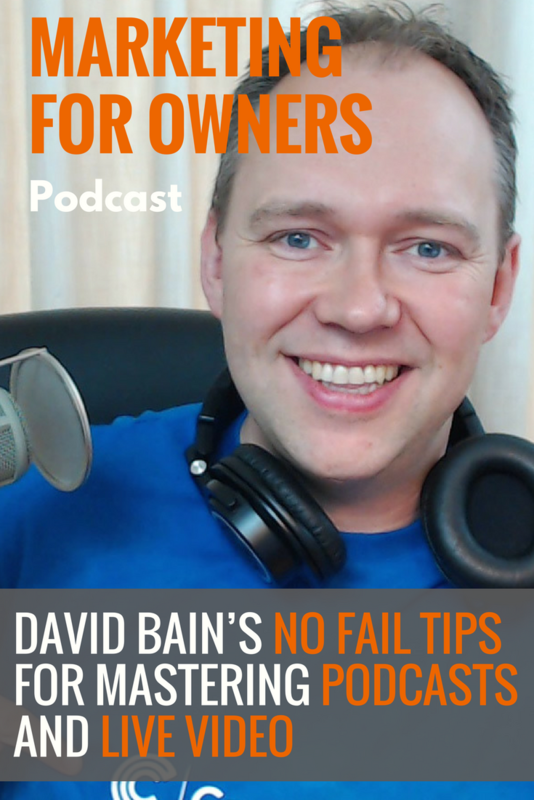 David Bain is the host of Digital Marketing Radio and has helped many businesses to achieve success on the internet. He’s been online since 2000 when he and a few friends decided that the internet was the place to be to become a millionaire. So they set up a business which did well but ultimately didn’t work because there were too many decision makers. After that, he started to figure out how to design websites himself and quickly made a full-time career of doing that. He had websites which topped Google’s searches and were making over $100 a day thanks to Google AdWords. Although he was good at it, it wasn’t what he was passionate about, and evolved his business into training. Then around 10 years ago in 2007, David wrote and delivered a seminar called The 13 Pillars of Internet Marketing. In fact, that seminar is still available to watch in full online. David used the feedback he received after that seminar to create his next training product, The 26-Week Digital Marketing Plan. And then came the Digital Marketing Radio podcast, in which he found a way of further helping his audience while doing something he had a passion for. David reveals how you can get into podcasting yourself, and the benefits of mastering it before trying out live video. At the end of David’s first seminar, he got as much feedback as possible from those who attended. And the only bit of negative criticism was that he gave out so much information, they didn’t know what to do next. So he turned his 13 Pillars of Internet Marketing into The 26-Week Digital Marketing Plan, in order to guide business people through the process. Since doing more studies, he has found that he should have instead created a 90-day course. That’s because it’s the average time people are willing to commit and far easier to get their head around than half a year. But David began podcasting soon after he first heard about it back in 2005 when Apple announced they would start reporting them. He figured out what a podcast was and listened to The Ricky Gervais Show. What he discovered is that it was (and still is) a modern method of communication which he knew was going to become fairly popular. By late 2005, he had experimented and had his own podcast. It was just him reading the business articles which had been submitted to his website at the time. It did reasonably well, and he still wishes that he’d kept it going. But at the time he felt it was better to focus on a comprehensive marketing plan rather than individual activities. However, with hindsight he now thinks it would have been better to instead zero in on a small number of activities. It was about two or three years ago after he’d thought about how much he stilled loved podcasting that decided he would treat it seriously. And that’s when Digital Marketing Radio came into life and has since been committed to. Podcasting is a lot easier than it has been in the past, and the barrier to entry has been lowered. And now it is growing and growing. And because there are so many around now, it is more important than ever to have a dedicated audience. He makes sure to give a lot out without asking for much in return. Terry Wogan (British broadcasting legend) used to have a radio audience of 8 million. And it was him who famously said when asked about it, that he only had one listener who he spoke to. It is vital to focus on producing the best possible content in the medium you love and are passionate about doing. That way, you can then build the audience, and then a business. The most important thing is to build a following of people who appreciate you and the content which you produce. There are so many devices capable of playing content, like podcasts and live video that you have to really hone your craft. Thankfully, David has a method for becoming a pro. David is frustrated by the terrible audio quality of such content. Even in videos, audio is such a vital part. It is what allows the audience to really delve into it and enjoy it. And with audio-only content, it is paramount. It is now affordable to have really good quality audio, so there is no excuse for it either. The problem with producing content on the fly, like people do with live video, is that people think audio doesn’t matter and can be forgiven. But the reality is that you still want to be putting yourself in a position where you are better than your competition, in as many different ways as possible. And your production values can be one of them. David suggests that going through the process of creating a podcast before going live is the best method. Then once you’re comfortable, move into pre-recorded video and then live video. From there, you could even then move into hosting your own online event. If you jump straight into the last stage before being comfortable with the equipment and knowing how to speak into a microphone, you won’t be good enough. And then you’re not giving people a good expectation of you. That then means that they won’t come back to consume your content again. Audio is at the heart of good content. Once you’re good at it, and comfortable (ish) with the sound of your own voice and articulation, then you can do good things. When you’re just getting started, the Samson Q2U and ART 2100 are the best microphones you can buy according to David. And they’re both available for around £50/$50. With a microphone, you should also use a windshield and a table folding spring stand. That means you’re then talking to the microphone about three to six inches away, and it reduces background noise. In order to avoid plosives (the sound you can sometimes get with p and t sounds), angle the microphone 45 degrees to your mouth. You don’t need the equipment which the top people use, and certainly not when you’re just starting out. When recording, you can use MP3 Skype Recorder which is free and will record a Skype call. That will enable you to make a podcast with someone else without having to find time to both be in the same room. This then creates it as an MP3 file. You can then put this into Audacity, which is also free, in order to edit it. You can cut the start and end of the conversation, compress the sound and then export it into an MP3 file which you can then publish. Then you need to use a hosting service. David uses and recommends Libsyn, which costs $12p/m. You need a specialist host to avoid your website from crashing as soon as people start to download the file. With a plugin, such as PowerPress, you can then produce a specific RSS feed which can go on your website. Plus, this is what you then submit to the podcast directories, such as iTunes, so they can send your latest episodes to people’s devices. Once set up the first time, many of these things will then run automatically. And if you do find yourself stuck, you’ll be able to find plenty of videos on YouTube to help you out. It’s important that you also enjoy the experience, and then as you do it more, you’ll noticeable get better at what you’re doing. Once you’re comfortable, you can then start recording the podcast as if it were live, in one take with no need to edit. David uses an app on his iPad called Bossjock Studio which enables him to play sound effects while he is speaking, such as intros, ends and bumper notes. It also means that you then become comfortable at making live content which you can then use to make videos, and it won’t be such a big step for you. Another good step to take is to not be afraid of letting mistakes out so you don’t waste masses of time trying to be completely perfect. If you spend too long perfecting things, you’ll then start to not enjoy it as much. When you have really honed your craft, and you’re serious about sticking with it, it is then the ideal time to start upgrading. Try a more professional microphone like David uses, such as the Electro-Voice RE20, and using editing software such as Adobe Audition. Even think about adding a mixer which will enable you to make adjustments to the base and treble. And for when you’re looking to produce great quality videos, David also recommends the Logitech C920 HD webcam. You can then use Hangouts in YouTube to record video of different people. Although you can broadcast live with it, you don’t have to. And that means you can get really good at using it before taking that big step. In December 2016, David had 110 digital marketing experts appear in a live broadcast he hosted over four hours. That meant he had one person every two minutes. You can find the video replay on his Facebook page, and as you’ll see, things don’t always go to plan even for the seasoned experts. In the broadcast, they all spoke about how Digital Marketing would look in 2017, and David is now turning that advice into a book which will be published January 31st, 2017. When you pre-order the book now, not only will you get the book, but you’ll also get some great software you can try out. You’ll receive 2 months free access to Hotjar’s business plan, 3 months free access to Aweber, and a lot more besides.